News in from John Cohen at Merle Wood & Associates of a €1 million price drop on his joint listing for sale with CSO Yachts, the 55 metre motor yacht Obsession. Designed by Phil Curran, Obsession was built by Australian yard Oceanfast and delivered in 1991 with a major refit in 2009. Unusually, she has an aluminium hull and a GRP superstructure, making her light, fast and strong. The 2009 multi-million dollar refit included an engine overhaul back to zero hours and she was fitted with zero speed stabilisers. DNV classed and MCA compliant, she is a popular charter yacht. Her Jon Bannenberg interior, refreshed during her refit, sleeps up to 12 guests in a master suite, VIP stateroom, two doubles and a twin cabin, all with en suite facilities. Powered by twin 3,480hp MTU engines and KaMeWa water jets, Obsession is an impressive sight underway and her shallow draft allows her access close to those secluded shores which other yachts cannot reach. 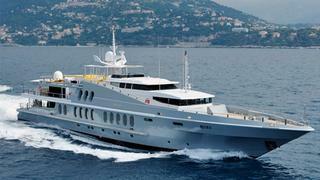 Available to view in the Mediterranean, Obsession is down from €7.5 million to €5.9 million.